Cheryl at Gluten-free Goodness tagged me for “One Lovely Blog Award“. 🙂 I was very honored to be tagged for this award. Thanks Cheryl!! 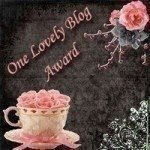 🙂 Now, it is my job to tag 10 blogs which I find are deserving of the “One Lovely Blog Award“. These aren’t all necessarily gluten-free, but other blogs that I find informative in one way or another & really enjoy reading. Angela at Oh She Glows – Angela has some awesome recipes & is a baker that hopes to be making gluten-free bars to add to her bakery very soon. Andrea at Off Her Cork – Always has fun & nutritious meals to blog about. I get great ideas from Andrea. Katrina at Gluten-free Gidget – Very creative gluten-free cook. Love the new puppy!! Jay at The Gluten-free Post – Jay has great information on his blog. Jenn at Jenn Cuisine – Jenn is an amazing cook & photographer. Amy at Simple Sugar & Gluten-free – I love reading Amy’s recipes & learning how to cook without sugar, too. Ali at The Healthy Hostess – Ali has some great healthy recipes on her site. Anna at Anna’s Eats – Anna is new to the blog world & I love reading her posts of what she eats & how she navigates her food world with allergies. Heidi at Adventures of a Gluten-free Mom – Heidi always has great, helpful information on her site. I love the post she just did yesterday….a recipe for Condensed Cream of Tomato soup. If I have tagged you, you can tag a number of blogs yourself or just simply accept that you have “One Lovely Blog“. 🙂 I enjoy reading them all. Happy Birthday Gluten-free is Life!! August 12, 2009 was the 1st birthday for my blog!! I have had a great time in the past year writing about all things gluten-free and sharing my experiences with my readers. I thought it would be fun to share some of my favorite posts & recipes from the past year with you. Brunch at Panera Bread ~ Gluten-Free! Most importantly, thank you to all of my readers. Also wanted to say a quick HAPPY BIRTHDAY to Gluten-free Homemaker! Linda is also celebrating 1 year with her gluten-free blog.